Reserve your trailer or campsite as soon as possible as they go quickly! or Diane Geitzenauer (908) 475-5447 sambits1022 at gmail.com. Please send pre-registration for Drag Races and Leader Contest to Diane Geitzenauer sambits1022 at gmail.com. DON’T MISS OUT ON THE 47TH ANNUAL SUMMER CAMPOUT! Once again the campout will be held at Twin Streams Campground, in beautiful Tioga County, very close in proximity to the breathtaking Pennsylvania Grand Canyon! The mountainous view from the campground alone is gorgeous! Laura Neese who placed 3rd this year in the Yukon Quest as our speaker! NEW! 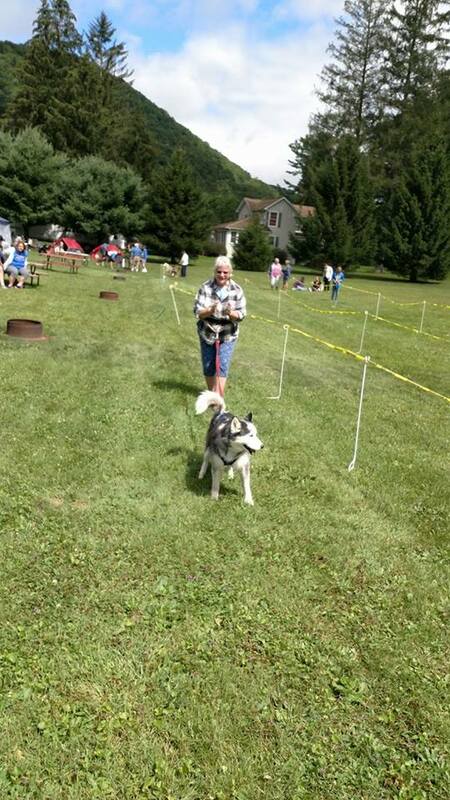 Natalie Norris’ Lead Dog Competition! Good Times with Human and Canine Friends! For Questions please contact Liz Stanaits 610-659-6453 musherette at verizon.net or Diane Geitzenauer 908-475-5447 sambits1022 at gmail.com. 7 – 8:30 AM – Breakfast – Dining hall - $5 per person - reservations suggested. Scrambled eggs, pancakes, sausage, hash browns, toast, coffee, and orange Juice. This is an opportunity to Bid, on your favorite team and possibly win some money! The team and driver is announced, the bidding begins and when the bidding is closed, a handicap is drawn (1-5 seconds). This number is then subtracted from the driver’s time! Money is given to the winning bidders in each category. All monies must be paid before start of Race. 11:00 AM – NEW!!! The Leader Competition invented by Natalie Norris! 12:00 – 1:00 Lunch – On your own. 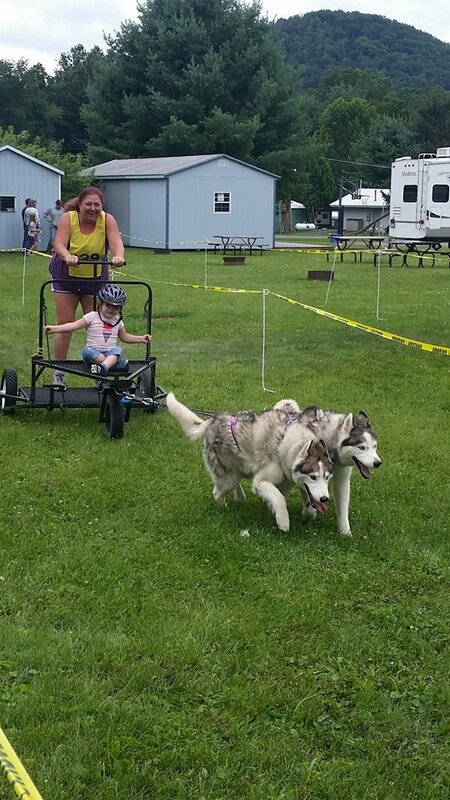 Walk around, meet the “mushers,” see racing equipment, training, breeds, questions / answers. Bring a dish/ dessert to share as well as serving utensil. Plates, & Utensils will be available. All welcome to join covered dish dinner, but must have reservations for Chicken/corn platter. 7:00 PM – Silent auction closes. Awards and thanks. 8:30 PM – Community Campfire – All are welcome! Besides the awesome entertainment / sing along with Mike & Ray – We’re going to feature, “Mushers Got Talent!”. We would like you to bring some form of entertainment to share – especially the kids! (A joke, poem, a song to sing, a dance, stupid human tricks, musher stories, etc!). Location to be announced. 8 – 9:30 AM – Breakfast – Dining hall - $5 per person - reservations suggested. Scrambled eggs,pancakes, sausage,hash browns, toast, coffee, and orange Juice. Everyone: Clean up of dinning hall, common area out side. Make sure you leave your area clean! Goodbyes — Thanks for coming and safe travels!